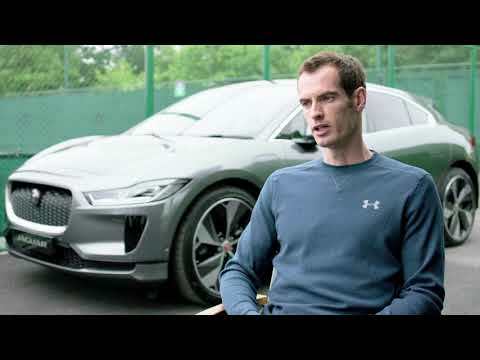 Two-time Wimbledon Champion Andy Murray fulfils World Wide Fund for Nature (WWF) pledge to ‘Go Electric. Supporting the commitment Murray made to switch to Jaguar’s first all-electric performance SUV in March this year, Panasonic Jaguar Racing driver and fellow WWF ambassador, Nelson Piquet Jr, visited the British tennis star at his training camp and made a special delivery ahead of the grass court season. Watch the film below. "It’s important we all take small steps to live a more sustainable life and think about the actions we can make to look after our planet. This is one of the reasons I’m making the switch to driving Jaguar’s new all-electric I-PACE. It’s clean and safe, but also has the world class design and sports performance that suits my lifestyle.."
"I think it’s brilliant that Andy has made this commitment to go electric and has been vocal in encouraging more people to take action and make little changes to live more sustainably. The Jaguar I-PACE is proof that you don’t have to sacrifice power or performance when you switch to electric." "Jaguar’s commitment to electrification is clearly demonstrated in the technological advancements they have made over the last couple of years, and their involvement in Formula E has been instrumental to that. It’s great to be part of this movement and to help promote and shape the future of battery electric vehicles."